The Mirror of Perfection contains the teachings of St Francis of Assisi (13th century), the writing of which is attributed to his disciple and close companion, Brother Leo. One legend associated with St Francis is the ‘conversion of the wolf of Gubbio’, and it is this legend that informs the frontispiece to this edition. As the story goes, a wolf was terrorising and eating the inhabitants of the Umbrian town of Gubbio. St Francis commanded the wolf, in the name of God, to stop, which he did. In exchange for his compliance, the inhabitants were to feed the wolf every day for the rest of its life, which they did. The engraving for this image is after an unpublished drawing by English artist and set designer, Charles Ricketts (1866-1931). 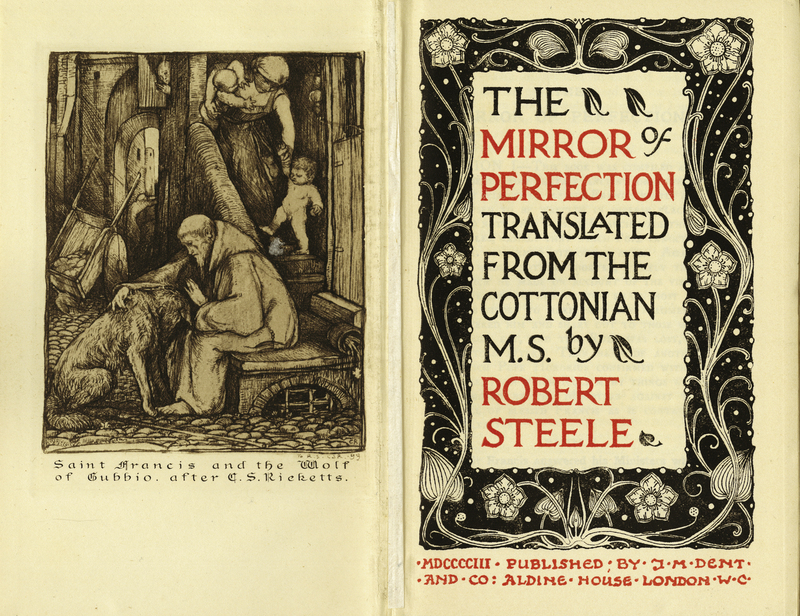 [Brother Leo], “The Mirror of Perfection,” ourheritage.ac.nz | OUR Heritage, accessed April 24, 2019, http://ourheritage.ac.nz/items/show/10710.